This column is intended to a kind of regional tip sheet, much like what we in radio used to get monthly from different sources .. it identifies what we in the state are airing as djs, and what the individual stations are representing musically here in the state. In Colorado we’re blessed beyond measure by the sheer number of public/community and college stations in our communities. There are about twenty radio stations of this type in the state today, the most of any state that I can find. Our charts this month represent spins data from over fifteen stations and specialty shows (commercial and non-comm) around the state. KRFC Fort Collins is, and has been, the undisputed KING of Colorado spins among all radio stations in the state. Today, approximately 13% (1/7) of all titles aired 6A-12A on KRFC are Colorado-based, up from an average of 6% per month prior to August 8th, when new program director John Hayes installed a new / more Colorado-focused format. Bummer news coming out of KUVO. A posting on Hazel Miller’s facebook page indicated that assistant music director/air talent Susan Gatchet-Reese is gone from KUVO (Denver). More news here as soon as I can get it. Welcome KRZA Alamosa/Taos to the mix this month — and welcome to new Music Director Catie Moore. Catie was doing front office work at KRZA from December 2010 until this past July when she was “promoted” to music director —- a hard and too often thankless task for sure, as she winds through mountains of releases each month. Finally this month, welcome back KCSU – off since the summer break began in May. Nic Turiciano is their new music director. I’m looking forward to seeing what they come up with. If this month’s station list below is any indication, it should be pretty adventurous. A note on the spins chart. I’ve added the date [month-yr] the release was added to the tracking spreadsheet – very often an indicator of when a station began reporting it to me. Beats Noir! – Beats Noir! 3. H2 Big Band – You’re It! The Colorado Sound … No real spins chart for the show this month. It was a short month. I took some of the month off to focus on producing and/or emceeing a couple of festivals. Here’s what was “Hot” in August (other than the weather). 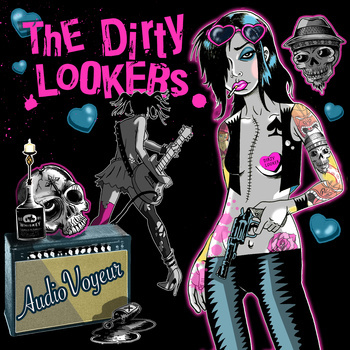 I do have to say I was particularly enamored of The Dirty Lookers album — a rough and tumble jouncy ride along the intersection of rock n roll, rhythm & blues, and punk.